What happens if you refuse to take the breath or blood test? 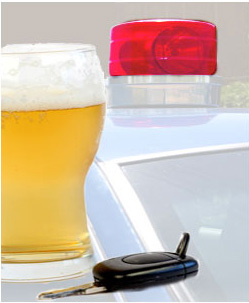 If you refuse to take the chemical test, you can (and most likely will) still be found guilty of Drunk Driving based on the Officer's standardized observations. You will also face penalties for not taking the test and will be read the following statement by the arresting police officer. 1. You have been arrested for operating a motor vehicle while under the influence of intoxicating liquor or drugs, or with a blood alcohol concentration at or above that permitted by law. 2. The law requires you to submit to the taking of samples of your breath for the purpose of making chemical tests to determine the content of alcohol in your blood. 4. Any warnings previously given to you concerning your right to remain silent, and your right to consult with an attorney, do not apply to the taking of breath samples, and do not give you the right to refuse to give, or to delay giving, samples of your breath for the purpose of making chemical tests to determine the content of alcohol in your blood. You have no legal right to have an attorney, physician, or anyone else present, for the purpose of taking the breath samples. 5. After you have provided samples of your breath for chemical testing, at your own expense, you have the right to have a person or physician of your own selection, take independent samples and conduct independent chemical tests of your breath, urine, or blood. 7. Any response from you that is ambiguous or conditional, in any respect, to your giving consent to the taking of breath samples will be treated as a refusal to submit to breath testing. 8. According to law, if a court of law finds you guilty of refusing to submit to chemical tests of your breath, then your license to operate a motor vehicle will be revoked, by the court, for a period of no less than seven months, but no more than 20 years. The Court will also fine you a sum of no less than $300, and no more than $2,000 for your refusal conviction. 9. Any license suspension or revocation for a refusal conviction may be independent of any license suspension or revocation imposed for any related offense. 10. If you are convicted of refusing to submit to chemical tests of your breath, you will be referred, by the Court, to an Intoxicated Driver Resource Center, and you will be required to satisfy the requirements of that Center in the same manner as if you had been convicted of a violation of N.J.S.A. 39:4-50, or you will be subject to penalties for your failure to do so. FULL TEXT OF ADDITIONAL STATEMENT FOLLOWS: I previously informed you that the warnings given to you concerning your right to remain silent and your right to consult with an attorney, do not apply to the taking of breath samples and do not give you a right to refuse to give, or to delay giving, samples of your breath for the purpose of making chemical tests to determine the content of alcohol in your blood. Your prior response, silence, or lack of response, is unacceptable. If you do not agree, unconditionally, to provide breath samples now, then you will be issued a separate summons charging you with refusing to submit to the taking of samples of your breath for the purpose of making chemical tests to determine the content of alcohol in your blood. Once again, I ask you, will you submit to giving samples of your breath?